For the sixth year in a row I've completed the Coffeeneuring Challenge, but this was the best year yet because of my Ride Buddy. Last year I barely completed the seven rides because life had been turned upside down with a 7 month old baby at home. This year at 19 months he was old enough to come along- at least on some of the rides! The experts say to wait until your child is at least 1 year old before putting him on a bike. He needs to have strong enough neck muscles to support the weight of his head plus the weight of the helmet. Also there is some concern about "micro-vibrations" and shocks, so I promised my wife I'd wait until Little Dude had reached his first birthday. Leading up to the big day I spent quite a bit of time modifying and outfitting my commuting bike to become our toddler carrier. I bought an iBert SafeT Seat and to accomodate it I replaced my drop bars with a set of Soma Oxford bars, Tektro brake levers, and Sun Race thumb shifters. I also splurged on Compass Barlow Pass 38mm wide tires to absorb lots of shock and vibration and give us a smooth ride. The iBert seat is great for the little one- he has an unobstructed view of the world as we ride and a fun steering wheel to turn. He can reach our brass bell, so once he learned how to make it ding that became one of his jobs- when we see someone else on the sidewalks and trails he dings the bell and says "Hi!" He is right between my arms, so I can tell if he's getting sleepy or uncomfortable, and- you'll have to trust me on this- when he needs a diaper change... The iBert is not so great for the Big Person piloting the bike... There's not enough room to get off of the saddle, whether it's for climbing a hill or just stopping at an intersection. Therefore the saddle must be lowered so the rider can put a foot down while seated. This is not a good bike fit, and though we're not going to be traveling long distances he does add some weight... That 24lbs of wiggly extra weight on the handlebars can sometimes make the bike handling a bit odd or unpredictable, too. I'm sure some folks thought I was a bit strange on my practice rides with 2 ten pound bags of sugar in the seat, but I wanted to be sure I could handle it! We started riding together back in the spring, and all through the summer we made it a weekly ritual to get on the bike and ride to the bank, to the playground, to storytime at the public library, and to the grocery store pulling our Bob Yak trailer. Ride Buddy got used to these trips, and apparently was enjoying them because he started getting excited when he'd see me preparing the bike and putting on my helmet. Now if he hears bike shoes clomping through the house he knows what's up and gets all worked up and ready to go! This makes it a bit difficult if I'm preparing to go on a fast ride with friends... We rode in the Raleigh Oaks and Spokes Kidical Mass event, and he had a blast. Since he'd become such an experienced biker, my wife and I discussed the idea of him joining me on this year's Coffeeneuring Challenge. She had some ground rules (which, of course were perfectly in line with mine!) #1- Safe routes. I had to plan routes that used sidewalks and greenways to access 7 different coffee shops (or coffeeshops without walls.) Any use of roads shared with cars should be kept to the absolute minimum. #2- No coffee for Little Dude! Shops had to have some kid-friendly choices like juice, whole milk, or smoothie. #3- Good weather. Daddy has a habit of riding the bike in any kind of weather ("there's no such thing as bad weather, only poor clothing choices") but we have to be more protective of our Ride Buddies... #4- NO CRASHING!! This has been a general rule ever since I started bringing Little Dude on the bike. I'm generally a very careful cyclist anyhow, but with this precious cargo I'm about 100 times more careful, head on a swivel- constantly watching for inattentive drivers pulling out of driveways, runners with earbuds on greenways, and dogs. Once I'd received Mommy's conditional approval I started looking for safe routes to see if the challenge was even do-able with a toddler on board. Amazingly, I was able to find six shops in fairly close proximity to our house and all but one had routes that were entirely sidewalk & greenway! 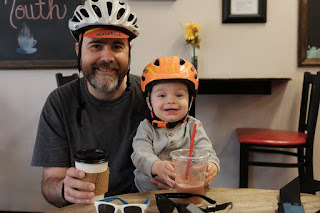 I checked in with Mary at the Coffeeneuring Authority Headqurters to see if a 19 month old who doesn't actually pedal and only drinks milk, juice, and smoothies would technically qualify. I was assured that as long as he completes all 7 rides he'd qualify, and he would become the youngest coffeeneur to date! I asked my son if he felt like taking on this challenge and he said "google," which I took as a yes! The local donut shop is just a few blocks from our house- not good for my waistline, and too close for the Coffeeneuring Challenge, so Ride Buddy and I rode the South Garner Greenway to White Deer Park, played on the swings for a bit and then stopped at the donut shop on the way home. We shared a glazed donut, Daddy had a café mocha and Little Dude had a fruit juice. This route was all sidewalk and greenway, and including the playground made it more fun. The donut and coffee were very good, but I wished that they had more kid-friendly drink options. Our usual Monday morning routine is an errandonné ride to the bank with a stop at the playground. This route is all sidewalks down Timber Dr. in Garner. Cycling on the sidewalk is a necessary evil with a toddler on board, but you have to be extra careful. Drivers aren't expecting anything to be traveling down the sidewalk at any sort of speed, so they're not really paying attention. Every driveway, every side street and light is a potential conflict point. Fairly stressful for Daddy, but Ride Buddy loves riding on the sidewalk. Each ramp down to cross a side street and ramp back up to the sidewalk on the other side elicits an excited "wheee!" We often encounter joggers and dog walkers, and it's Little Dude's job to ding the bell to let them know we're coming. I slow way down out of an abundance of caution, and he happily says "Hi" as we pass, usually more excited by the dogs than the humans... In the same shopping center as the bank is a Target department store with a Starbucks inside. We dropped in, and Daddy had his usual café mocha while Little Dude got an apple juice. He was pretty thirsty, and drank the whole thing- usually he doesn't finish one. Since that meant an impending diaper change we rode straight home and decided to go to the playground after naptime. On Tuesday Ride Buddy wanted to go to storytime at the library. They have singing and dancing, read stories, and at the end there's everybody's favorite- bubbles! After storytime we rode to Aversboro Coffee, our favorite local coffee shop. Daddy had his usual café mocha and Little Dude had his favorite, strawberry banana smoothie. We colored in their coloring books some and our barista Tawny took our picture with Daddy's camera. This one was perhaps the most fun I've ever had on a bike (and that's saying something...) Ride Buddy wanted to go to Trick Or Treat Storytime at the public library and he insisted that Daddy dress up too! He went as a dragon, and I went as his big fuzzy stuffed kitty cat. His dragon tail was a tight fit in the iBert seat, and my cat tail was dangerously close to getting caught in the spokes! 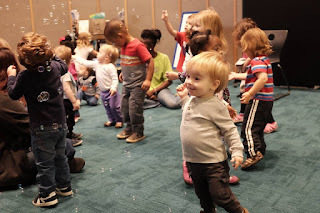 We rode through Garner dressed in our costumes and went to storytime where they had lots of singing and dancing, a spooky Halloween story, and trick-or-treating around the library. After storytime we rode to Lake Benson Park for a coffeeshop without walls. We played at the playground and swung on the swings, then relaxed with our prepared-ahead-of-time beverages at the picnic tables. Little Dude loved running around town in costume and seemed to get a big kick out of the fact that Daddy was dressed up as a big fuzzy kitty cat. We went home and took a long nap so we'd be ready for more trick-or-treating fun with Mommy when she got home from work later. All sidewalks and greenways, and no tails caught in the spokes! Our usual Monday morning errandonné to the bank again- this time Ride Buddy was flirting hard with the teller... We're going to have our hands full with this boy. She gave him THREE stickers for his collection! After errands we rode all the way down Timber Dr. to McDonalds (we've just about exhausted our coffee possibilities in close proximity to the house.) This route was all sidewalks, but did require that we cross Timber Dr. twice- a busy 4 lane road w/a turning lane... The speed limit goes up to 45mph out near the McDonald's, so of course people tend to go about 60mph. Daddy was not taking any chances, so we just waited until there were no cars anywhere nearby before we went. This is the first time in 6 years of Coffeeneuring that I've visited a McDonald's! In years past I've ventured much further afield to find small shops, but this year I kept the rides shorter. It was a dreary Tuesday morning, threatening rain so I suggested we wait till the next week to complete the challenge... Ride Buddy wasn't having it and demanded "BIKE!" so we geared up and headed to Full Bloom Coffee Roasters, the newest coffee shop in town. I stuck a small umbrella in my messenger bag, figuring if we got caught in the rain I could walk the bike home with Little Dude protected under the umbrella. Luckily that didn't happen! I'd saved this shop for last because I needed to figure out a safe route- it's on the other side of Hwy 70 and the bridges that cross the highway don't have sidewalks. My scouting determined that the safest crossing would be the Hwy 50 bridge, we could ride up Aversboro on sidewalks, cross over into a quiet neighborhood and come out right at the bridge. Then we'd only have to share the road with cars across the bridge and pick up the sidewalks on the other side. We timed our run carefully and avoided the cars, safely arriving at Full Bloom for an amazing honey cream cold brew with cinnamon for me and a cuppa whole milk for Little Dude. We also shared a celebratory blueberry muffin before heading back out across the bridge to the relative safety of the neighborhood. It was still dreary but no rain yet and we decided not to chance it, but ride on home and drive the car to storytime at the library. Safely back in our driveway I told Ride Buddy that he'd officially qualified as a Coffeeneur! He dinged the bell a few times in celebration, then we put away our bike and helmets so we could head to the library. So that's it for the official rides, but our adventures continue! At the start of the challenge he was 19 months old, making My Ride Buddy the youngest ever Coffeeneur to date! I'm not sure who's having more fun- him or me, but I love the fact that I can share my passion for cycling with my son. I get a huge kick out of seeing him enjoying the rides, pointing out the things we see along the way, and greeting the people we meet. I can't wait for the days when we're sprinting for county lines and he's dropping me on the hills! I have enjoyed all your fb posts. Go ride buddy!